Monica Gale Top STAMPIN'UP! UK Demonstrator: FREE RIBBON?????????? DID I SAY FREE RIBBON? 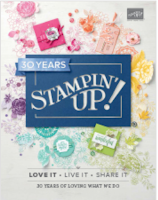 Yes I did because that's exactely what you get if you place an order of £45.00 or more with stampin'Up! throughout the August month. You not only get one reel you get TWO A 9.1 meters reel of So Saffron grosgrain type and one 9.1 meters reel of Certainly Celery polly twill. I have just placed an order myself so I will be showing you some samples of it soon. Tempted? I'm sure you are a girl can never have to much ribbon can she? 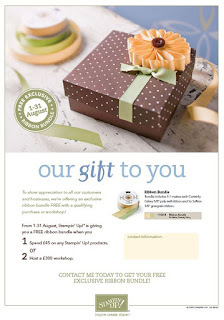 Well I am here to tempt you even more, place a qualifying order with me and not only you will get your beautiful ribbons for free you will get your order shipped for Free( please note free postage does not apply if you are a member of my Stampers 10 clubs). Also I will enter all the orders into a draw and the 3 lucky winners will win a stamp set of my choice each. To place your order email me at telemech01@aol.com . I had to make a card for my friends boy the other day and I think I got it so wrong. 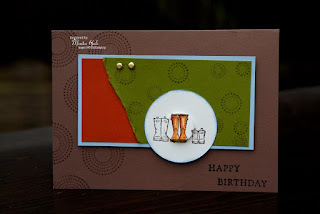 I love the combo and I like the card, but the colours are wrong for a 10 year old. Yes I know you agree and not got a clue what went over me really, not for a minute did I think ohh this might be a bit to serious for a 10 year old. Monica-I agree-it is too grown up for a 10 year old but not disasterous! I can see you went for gardening colours but you made a great card anyway. It's easy to start off doing one thing and then the card makes itself into something else. I made a birthday card in a real hurry for my 76 year old MALE neighbour who likes gardening. I used regal rose, certainly celery and flowers and a bird stamp. Gorgeous card-for a LADY!Didn't work at all-not sure what happened but hey ho! I love it! Little boys love to be grown up don't they and I think it's very special. Loving the wellies!